Multilingual education for students belonging to China’s 55 ethnic minority groups presents challenges of learning their home language, the national language (Mandarin) and a foreign language (usually English). The difficulties faced by such students in coping with multilingualism are exacerbated by the demands that are placed on the education system for coherent policy implementation; adequate financial, infrastructural and human resources; and ensuring community understanding and support. The language-in-education practices that have been observed across the nation have been found to vary according to local conditions. This chapter focuses on practices in schools in Qinghai Province, in Western China, where a number of ethnic minority languages are spoken. 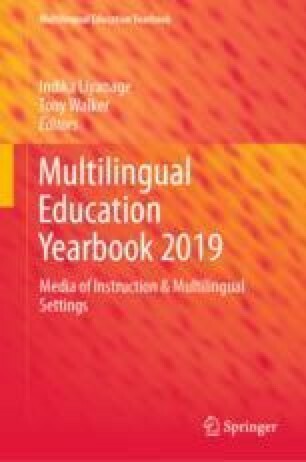 In particular, it investigates how the choice of medium of instruction in individual schools is a product of contextual factors including the role and status of the different languages, beliefs about language learning, and the systemic support available. Two main models are identified: one is to use the dominant local ethnic language as the medium of instruction, with Mandarin and English as curricular subjects; the other model involves the use of Mandarin as the medium of instruction, with the ethnic language and English being taught as subjects. The chapter evaluates the achievements and shortcomings of each model and argues that effective implementation of multilingual education in Qinghai Province is hampered by weak infrastructure and policy frameworks.